“Plov” originated from Uzbekistan centuries ago but it has also become a staple dish in Russia. 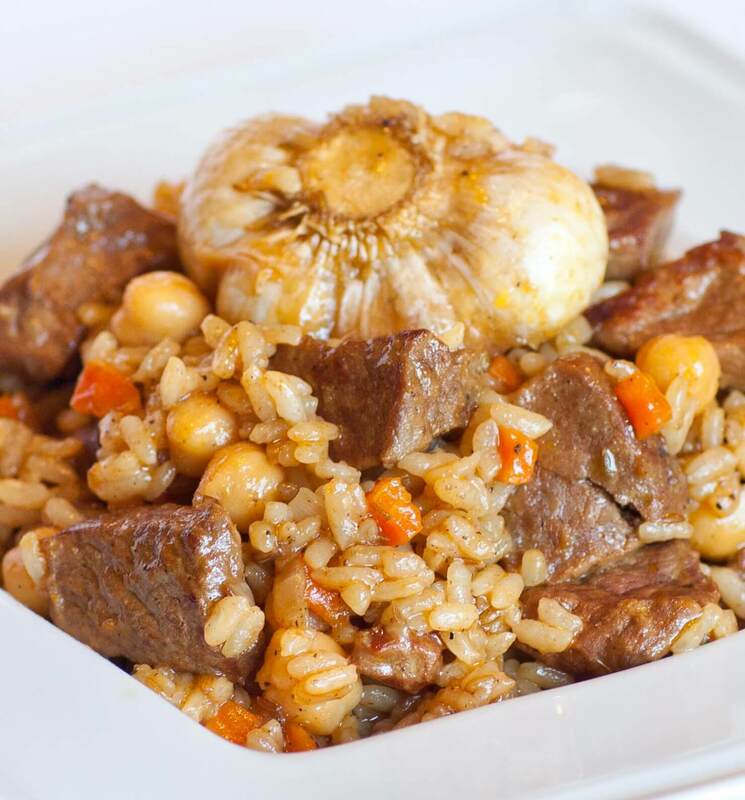 This very traditional and classic ‘Beef Plov’ recipe is delicious and will not disappoint! The original recipe, and how I make it, is made only with beef or lamb. You can also substitute the beef with pork or chicken. Season cubed beef with salt. Preheat large, nonstick heavy sauté pan or Dutch oven to medium/high heat and add a splash of olive oil. Once oil is hot, add beef until it develops a dark brown color. Remove beef and add to same pan the onion, carrot and garlic. Sauté until golden brown. Return beef to pan and add to pan broth, seasonings and stir together. Cover, reduce heat to low and simmer for 1 hour until meat is tender. Once meat has cooked for 1 hour or until tender, add garbanzo beans. Sprinkle uncooked rice over the meat and broth. DO NOT stir the rice and meat together, simply sprinkle the rice in an even layer over the meat, and arrange it so it is submerged under the broth. Season with fresh ground black pepper, cover and continue to cook over medium/low heat. Do not stir the rice during cooking time (Stirring is avoided to create light and airy rice that is not mashed together: don’t worry, it will not burn!). Stir together rice and beef once the rice is done cooking. 🙂 That’s wonderful! I’m so glad you and your guests enjoyed it! 🙂 I’m so glad to hear you enjoyed it! Thank you for watching! Really loved this plov..but one question..how long and what temp. Do you cook the dish for after you put the rice in..and do u put the lid on?? Mine came out a little mushy!! Lol sticky..
I’m glad you enjoyed the recipe! Yes, you do want to close the pan with a lid. I cook for about 30 minutes, just until the rice is cooked all the way! The type of rice you use is also important; I use California Calrose Long-grain rice. Also, don’t stir the rice while it cooks; if all the broth evaporates, you can add 1/2 cup at a time until the rice is cooked. 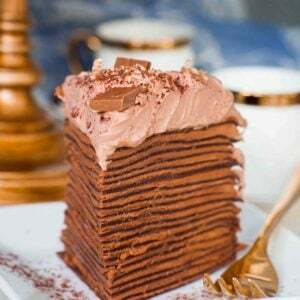 Hi Tanya, I love all your recipes! Thanks for sharing them! Im making plov by your recipe. Its almost done. Plov smells sooo so good! Its my first time making plov. How long does the rice cook in the pan with all the ingredients? Hi! 🙂 I hope you enjoyed my recipe! Plov is one of my favorites! You need to cook the rice just until it’s completely cooked. You can give it a taste-test and if it’s not cooked all the way through, continue cooking. If all the broth has evaporated, add about 1/2 cup at at time. I am seriously in love with this plov! It’s the best of the best that I have ever tried by far!! Thank you a ton!!! Some plov recipes have it where the rice is sitting in hot water while the meat is cooking. Do you have to do that with this recipe? Do you rinse the rice in advance before you place it into pot with the meat? I’m about to make this but want to use white jasmine rice instead. How much broth should I use? Hi! I don’t recommend jasmine rice as it can get very soft but if you’re already making it, add maybe a cup less of the broth and add more if necessary. Hey, would parboiled rice work? What kind of oil did you use in the beginning to brown the meat? Will be making this recipe next week! I made this tonight and it was sooooo good! I am a very picky eater and I loved it! My husband loved it too. We will definitely be adding this to our dinner rotation. Thanks for the recipe!